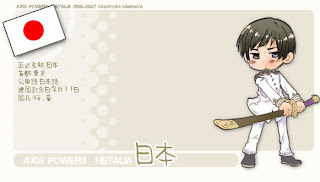 Gue iseng nyoba ikut kuis Hetalia di Quizzila dan hasilnya adalaaaaah..
A guy with an intimidating air who doesn’t talk much and is difficult to understand. On the inside he’s playful, but it doesn’t show at all and he just seems scary. There was also a time when he was called the Supreme Ruler of Scandinavia, but nowadays he’s calmed down and put a lot of strength into welfare. He likes being a “weekend carpenter” and decorative arts. He also likes arguing. - A small country that appeared in the latter half of the world's history and didn't take more than several decades to become a powerful country in the orient. - As an island nation, he holds distinct cultures and customs which other countries see as mysterious even though he himself thinks he's perfectly normal. - Has a personality where he doesn't know much about the world, but is hard-working, serious, skilled with his hands, and needs time to adjust to other people. Loves watching the seasons change by admiring flowers and the moon, believes elegance is the best. Oh, sweet little Japan. So inexperienced in the outside world at first, but does his best to learn all he can! 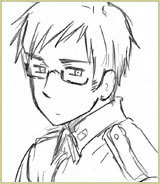 Very studious and curious, Kiku is an intelligent individual who is always willing to expand and better his knowledge.